Are These Common Sleep Problems Wrecking Your Rest? 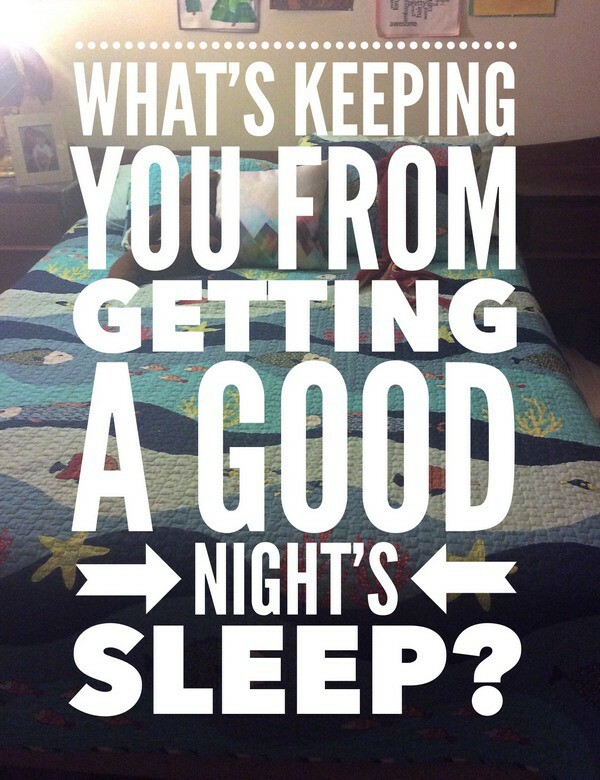 When was the last time you got a really great night of sleep? If you’re like me, chances are you can’t answer that question. I couldn’t tell you the last time I didn’t toss and turn all night or wake up feeling achy. I try to do everything right. I keep my room temperature reasonable, I minimize distractions by banishing electronics. I really try to go to bed at a decent hour, use a great pillow and wear my comfiest jammies. Still, I wake up miserable. I know I’m not alone. So what’s wrecking our sleep? I think I suffer from most, if not all, of those! I definitely have a bad back. I toss and turn all night. Support? Not with my current mattress! I also sleep hot because of my migraine medication. As for partner movement, it really depends on whether Jake decides he doesn’t want to sleep in his own bed that night. Want to hear more about my quality of sleep? Check out my sleep diary video! Admittedly, I was a little nervous! I mean, it’s not often I invite ALL of you into my bedroom. Okay, ANY of you, for that matter! If you were paying attention, you heard me talk a bit about how I was researching Serta Perfect Sleeper mattresses and what I learned about the best type of mattress for me. Let’s talk more about that! Did you know that Serta teamed up with the National Sleep Foundation to help us all get a better night’s sleep? The Serta Perfect Sleep is the only Official Mattress of the National Sleep Foundation that addresses all five of the common sleep problems. Even better, the mattresses are designed with a variety of options, so you’ll find something to fit your budget. In fact, mattresses start at just $399 for a standard queen! They range up to $1,299 for standard queen-sized sets. The 2015 advancements are pretty spectacular. You can now get the Cool Action™ Gel Memory Foam in select Perfect Sleeper models for the first time. You’ll also find Custom Support® Individual Advantage coils in select models. Want a memory foam mattress? The new Perfect Sleeper Memory Foam line provides you with an option at a more affordable price. I love reading in bed. However, I don’t love propping up 50 pillows to get comfortable. I’m excited to hear that both The Pivot and The Motion Essentials adjustable base options are compatible with Serta Perfect Sleeper Mattresses. The Pivot lets you adjust the head of the mattress while the Motion Essentials allows you to adjust both the head and the feet. I’m definitely looking forward to finding the perfect Serta Perfect Sleeper for me! I’ve been doing a lot of research on the Perfect Sleeper website. I thought I knew what mattress was best for me, but it turns out I may have been wrong. Serta has a fantastic mattress selector tool to help you discover the right mattress for your needs. Try it out, you just might be surprised at the results too! I’ll keep you updated on which one I choose! Are any of the five common sleep problems keep you from getting a good night’s sleep? Tell me about it! I need some good sleep myself and a new mattress badly. I haven’t bought a mattress in quite some time and don’t let me get started on the hubs…I am on the verge of putting him on the couch so I can sleep comfortably. I suffer three out of five sleep problems you mentioned above. I remember it was even worse during the first two years of my daughter’s life. My sleep was practically nonexistent back then. The sleep has gotten better now, but I still have restless nights every now and then. Most of the time it’s because of the temperature battle in the house. I always feel hot, but the rest of the household seems OK to sleep when the temperature is 77F. Ugh. Sometimes I wake up and try to find a cooler spot on the mattress. It can get quite frustrating at times. I added a topper to our bed and it helps somewhat with the comfort level of our mattress. I have a horrible back too. I have always had trouble sleeping, which has always lead me to really weird sleep patterns. I actually used to take prescribed medicine for it, but since I’m pregnant, I had to quit for now. So we decided to get a new mattress, and thought maybe that would help. I’m actually falling asleep faster, but I still just tend to wake up in the middle of the night, and I can’t go back to sleep. Who knows! We actually bought a BeautyRest mattress, but Serta was a toss up for us. Both are great. This is so timely. I have been not getting enough good sleep hours mainly because of my bed. I feel that I have been getting back pains and I think that I need to get a new mattress; I just need to know where I can get something durable ( you know how those foamy ones just get flat in a short span of time ) and it’s an investment that I feel I need to do. I will make sure to look up and check on Serta. I haven’t had a good night’s sleep for over 9 years. I rarely sleep more than 1 hour a night and have tried everything to try to get some much needed sleep. I have 4 or the 5 issues above. I just updated my mattress with a topper, got all new bedding, and new better pillows, they where a bit pricey but well worth it to get a better night sleep, i find myself waking up less though out the night now. I would love to get the Cool Action™ Gel Memory Foam in select Perfect Sleeper models to help with getting warm at night! I would love to sleep on a cool mattress! I want to get one of these awesome mattresses! I know it would help with my sleep. The Cool Action gel sounds interesting. Keeping cool at night always helps us sleep better, and we live in a pretty hot place so blasting the AC all night isn’t a cost-effective option. This is awesome. Okay, I have been having sleep issues for the last few weeks. I’m too hot while everyone else in the room is cold (husband and baby) and I toss and turn a ton. My back acts up sometimes (thanks epidurals!) but not often. I have a really great, and super expensive mattress because of the epidurals messing my back up. My son however, has major issues and I need to look into getting him a new mattress. $399 for a queen, I will be checking it out. He just recently got a queen sized bed, and he hates it. Not comfortable at all! There is nothing that sets the tone for your day like a good (or bad) nights sleep. A good mattress definitely helps. I am actually thinking that a second mattress in the basement for my husband would help me! These are amazing tips for getting better sleep! A good quality mattress makes all the difference for a good night sleep! I never thought to try a topper for our mattress before like this sounds great! I suffer from different sleep issues but back pain is at the top of the list. I’ve been told that I might need a new mattress to help this issue but I’m still not sure that would help. I’ve been looking and pricing mattresses though and my favorite brand is Serta. Thanks for sharing. I just moved into my new apartment and I do not have any furniture or anything and my current bed is air bed and let me just say how painful my joints are saying to me. Its been a very (x100) long time since I last had a good nights sleep been too long.